The following dogs are not under the care of Peace of Mind Dog Rescue. 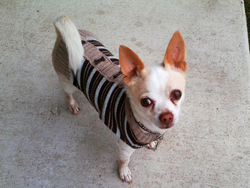 We provide these listings as a courtesy to the community to help these dogs find new homes. Please contact the person listed with the dog's write-up if you're interested in finding out more about one of them. Zip is a 7-year-old sweetheart at about 45 pounds. She is house trained, walks well on leash, and know some commands. She has spent most of her life on an open property and is not used to running errands in town. She is always happy to meet and see people, though. 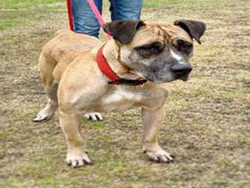 While eager to meet people, she does not care for cats and wants a home without them. Her ideal home has a fence yard. While she can live with other dogs, she may be most content as a single canine. Zip has been well loved and her personality shows it. 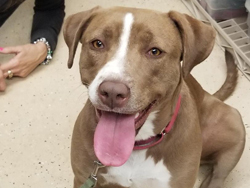 She would love to spread her joy to a new family. If you are interested in meeting her, please contact Ken at avoaday@icloud.com or 831 406 7020. Holden is a 5 year old neutered male, and a GOOD BOY. He gives sweet kisses and is super-duper loyal. He is over the top OBEDIENT. While curious with cats, he will not chase when corrected. 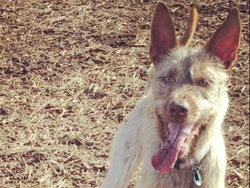 He is happy around other dogs and has been introduced to horses, goats and even a pig. Holden does not wander and will stay at the door waiting for your return. We would prefer to see him go to a one dog family on a ranch, so he gets one dog attention and can "work." German Shepherds are a "working breed." If you have another balanced dog, and have large dog training experience, we will consider that home too. He is at the nonprofit animal rescue in Aptos Hills at Castlewood Ranch Foundation Inc. 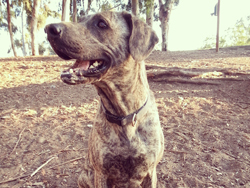 Contact kelly@castlewood-ranch.com or call 831-687-0207 to make an appointment to meet Holden. Sunshine was thrown out of a car and left to survive. After a 4 hour surgery and 10 days in an ER, she survived and is a beautiful, vibrant girl. She is 3 years old, housebroken, trained, VERY loving, sweet, high energy, loves car rides in spite of being tossed from one, loves banannas, playing ball and running. No cats for her, a submissive but friendly companion would work and no small children because shes strong and we wouldnt want her to knock them over. She loves all people even the little ones!! Please call Amy 858-254-7466 or time4blinds@gmail.com She would be a fabulous companion!! These two males are beautiful and fluffy. Dusty is 65 pounds and Snowy is 75. 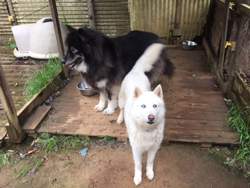 Both are 10-year-old great dogs in need of a new home after their guardian passed away. They are currently living in boarding at the Sacramento Independent Animal Rescue and are a little kennel stressed. They were both being poorly cared for during the latter stages with their guardian who passed, as he was unable to physically care for them. They both know basic commands and are good on leash. They seem to do well with other dogs and should go to a home without cats. They would love to have a backyard to explore and keep them contained. Indica and Lucy are 7 and 8 years old respectively. They are two beautiful and wonderful dogs that absolutely have to stay together. 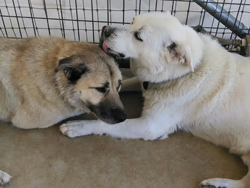 Lucy is 100% bonded with Indy. Indy is a bit hyper and loves everyone. Lucy used to have anxiety but she has settled in well and is very calm with Indy. Both are sweet and non-aggressive. Indy has a strong prey drive though. Since they love the cold, they are almost always outside. They have active lifestyles but calm down quickly with human interactions. Hello! My name is Scooby and I am ready for a new home. I was found by my foster at Riverside Shelter and would love for my very own people to hold me. My foster, Lorraine, wanted to help me get recognized. She is always saying great things about me and I make sure she is speaking the truth. She'd keep me herself but her house is full. This handsome Dachshund is Roscoe. He is 5 years old and super sweet. Roscoe is neutered and listens well. About a year and half ago, Roscoe broke his back. He had surgery at pet specialists in Del Rey Oaks but he is still unable to use his back legs. He gets around well in a wheelchair, that will go to his new home with him. Stella is a sweetheart Poodle at 8 pounds and 14 years old. She is looking for a new home because her guardian is ill and can no longer care for her. 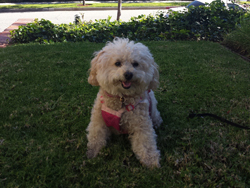 Stella walks well on leash and responds to basic commands. She is comfortable with dogs of all sizes and happy to have canine siblings. She is a calm dog that relaxes in a bed or on a lap. 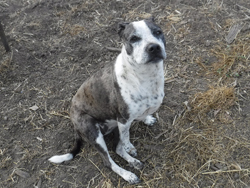 Eli is a handsome, 6-year-old Catahoula. He is house and crate trained. Eli also knows basic commands. He absolutely loves people and even kids. He cannot live with cats though. 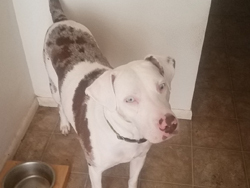 He has lived with other dogs and could either be an only dog or have a canine sibling. He is fairly high energy and can be a great companion for adventures. 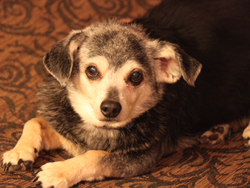 Prissy is looking for a new home because her person has cancer and became physically unable to care for her any longer. 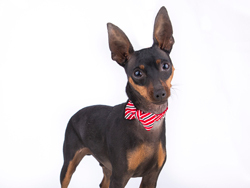 She is a non-stop tail wagger that loves her people and hopes to bond lovingly to a new family. She loves to cuddle and be a lap dog. She is food motivated and easy to direct with treats. She is friendly with other dogs and could happily live with them. Has never lived with cats or children. Virginia is with All Creatures Great and Small Rescue and was dropped off in the night box at Hollister Animal Shelter. Her guardian never came for her though she is such a sweet, loving, gentle soul. Virginia is in good health, no medical issues to be concerned about, she just needs to loose a little weight, so more walks and healthy food are on the menu. 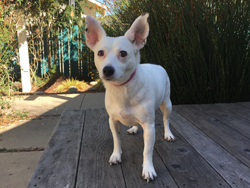 She is an easy soul to care for, gets along well with other small dogs. She enjoys going on walks, plus she is housebroken. Virginia would be a wonderful companion for a couple that works and one can come home at lunch to give her a short walk or a retired couple or person. Please consider adopting and giving Ms. Virginia a forever home, she deserves it. 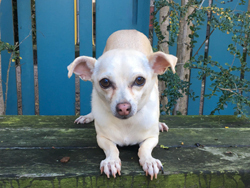 Virginia is an 11-year-old, female Chihuahua. Charlotte was found as a stray with two puppies. She was the BEST mom. They have weened off and Charlotte has been living with a foster family for several months. Charlotte loves being part of a pack. She comes when called now and thrives with a routine. She is head shy but eventually warms up and sits, enjoying pets and attention. She is happy and energetic unless she's nervous. Those are her two moods. She needs an adopter who is willing to keep working with her to acclimate to a good routine and life. She loves the outdoors and water. She is certainly a good girl. She is 2 years old and under 15 pounds. Butters is a little lady that is starving for attention. She is ready for someone to show her love after her person entered a nursing home. 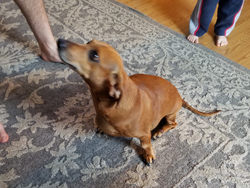 Butters is 6 years old, spayed and healthy. She does well at home, being potty trained. She is also good on leash during walks. She hopes her future home has ample time for her to spend with her people. She is good being supervised around kids, except for if they try to pick her up. She is comfortable around and living with small dogs. Indie has been a wonderful dog in the same home for 11 years, which is her whole life. She is about 50 pounds and is a mixed breed. She gets along and interacts with both dogs and cats but on walks she pretty much ignores them. She loves people and is friendly to adults and kids. She's pretty well trained, we did clicker training through the Humane Society when we first got her. She is house trained. She also has arthritis and could benefit from supplements. She has been an outdoor dog bu could be great in the home. Her current environment is too demanding with the stairs and severed slopes . We are hoping to find an alternative living situation where she would be more comfortable. A good fit for her would be somewhere she could get some loving attention, sleep, and go on daily walks, avoiding things that are too physically demanding. She is currently in San Diego. Chico is VERY FRIENDLY with ALL people, even with children. He will greet everyone as if they are his people. According to his vet, he is very healthy. He does have a sensitive stomach that requires a specific diet though and no treats. Chico does well with other dogs, having improved considerably after some positive socializing, but would like prefer to be the only dog. He is good with cats. 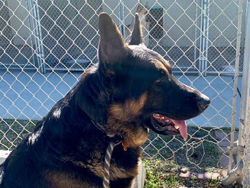 Ideally, he would have a retired home or one in which he is rarely alone as he adores attention. Hi, I am Tadeek. A 3 year old Terrier mix. I am 55 lbs, playful, smart and athletic. I love to kiss, play fetch, go for long runs and play with my other doggy friends. I am crate trained and house trained. I have no bite history and have never shown aggression towards people or dogs. 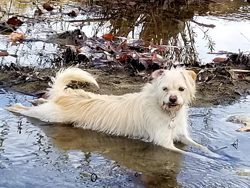 I am perfect for an owner who can understand that I am sensitive to my surroundings and can sometimes get overwhelmed by unfamiliar situations or people, causing me to want to hide or respond with my tail between my legs. Once comfortable, I love to give lots of love, snuggle up on the couch, and be your best friend. If you love to run, be outdoors, love to watch me play with doggie friends, then I am the perfect one for you. I also come with free training. 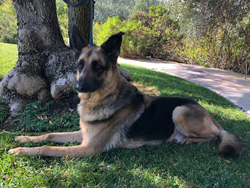 Please call 818-983-6350 to meet Tadeek. My name is SOMEBODY. I am a neutered male, brown and black Bullmastiff mix. The shelter staff believes me to be about 5 years old. I have been at the shelter since Dec 05, 2018 and came her after my person passed away. I am friendly and get along with other dogs. I am eager to meet others and non-reactive when others walk by. I will show you endless love if you help me into a home.